Several years ago Sinn Féin set out our view that the most effective truth recovery mechanism was an International Independent Truth Commission set up by a reputable international body such as the United Nations. That remains our view but the British Government have consistently rejected it. Despite that we have engaged with all other propositions on these matters in a positive way. On Thursday night past I listened to Irish Foreign Minister Charlie Flanagan speak at the Relatives for Justice Pat Finucane Memorial lecture. He reaffirmed the Irish government’s view that a full public inquiry should take place into the murder. Despite incontrovertible evidence, and an acknowledgement of British state collusion in the murder of Pat Finucane, the British government continues to deny his family the public inquiry into his death that was promised at the Weston Park Talks 16 years ago. The British government’s stonewalling on this inquiry reflects a wider policy, which refuses to deal with the past. Their intent is to prevent any independent investigation or scrutiny of British policies and actions over a 30-year period of the conflict. For instance, the British Government denial of financial resources to the Lord Chief Justice for legacy inquests is a further example of this blocking policy. Their construction ofa bogus ‘national security’ veto over this reinforces that view; providing further evidence that the British government, alongside the DUP, is neither serious about dealing with the past nor engaging meaningfully with the needs of victims. Despite agreement at Stormont House Agreement in 2014 on a range of mechanisms with a potential to provide some relief for families and victims the British focus since then has been to block, restrict and dilute their implementation. ‘National security’ is the pretext, of both the DUP and the British Government, for the veto on the implementation of the mechanisms agreed and the commitment of onward disclosure of information to victims’ families. This is consistent with the strategy of denial and delay that has prevented the agreed public inquiry into the death of Pat Finucane. The pretext, of both the DUP and the British Government, for the veto on the implementation of the mechanisms agreed and the commitment of onward disclosure of information to victims’ families. This is consistent with the strategy of denial and delay that has prevented the agreed public inquiry into the death of Pat Finucane. At its core the British are refusing to make information available that will show that they had clear policy in the conflict that involved state-sanctioned torture in interrogation centres, collusion with Unionist paramilitaries and a shoot-to-kill policy. This British government aims to prevent relevant information being made available and has halted the implementation of the Stormont House Agreement legacy mechanisms. Despite 16 meetings with British officials, and the production of a Sinn Féin legacy options paper, we have yet to receive a response to our proposals. Indeed we have yet to receive any British Government proposals on how we are to engage with their ‘national security’ veto in a way that satisfies the families and victims’ demands for information and their right to truth. The campaign by elements of the British Conservative Party and Unionist parties, to introduce legislation to give immunity to former and serving British service personnel, supports British Government policies of protecting those in the political and military leaderships who designed, developed and implemented British policies during the conflict. This is unacceptable to families bereaved by British state personnel. Sinn Féin acknowledges the loss and injury of all victims and survivors during the conflict. For us, engaging with all of the related issues is a matter of rights and equality. Our approach to legacy negotiations will always be guided by our commitment to universal rights. The grief and trauma suffered by all families during the conflict are the same. There can be no hierarchy of victims. All victims must be treated on the basis of equality. There can be no hierarchy of loss. Engaging with legacy will also present challenges to Republicans. Sinn Féin will use our influence to ensure republicans cooperate with the Stormont House Agreement legacy mechanisms. We are not introducing caveats, or hiding behind a national security veto. We are not blocking progress. – Be an advocate for the provision of high quality services for all those harmed during the conflict. The real question now is whether or not others are up for the challenge. 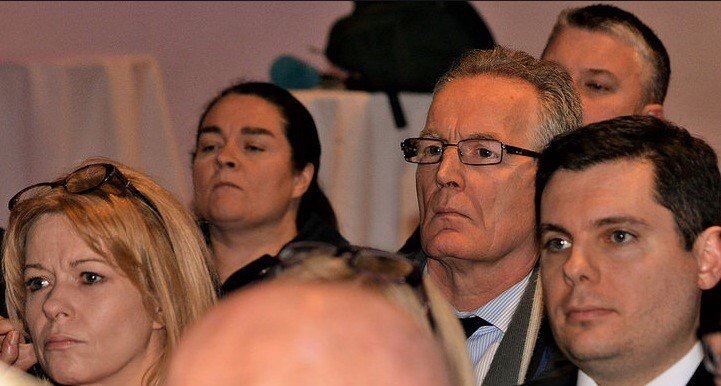 As to be expected, Gerry Kelly uses 75% plus of his article to cry, ‘Brits this, Brits that,’, Implement, implement……. How about this one Gerry, Implement the Good Friday Agreement Terms! My father’s killer was released from the Maze early, under the Terms of the Good Friday Agrrement, went on to murder a taxi driver (although never lifted, or charged due to political expediency!) and is currently serving a Sentence for Attempted Murder in Mountjoy Prison. Correct me if I am wrong, but is this not a clear breach of the Terms of the Good Friday Agreement?? I have repeatedly asked the question if my father’s killer will be returned to jail to serve out the remainder of his Sentence for my father’s murder and have been left with a wishy washy doublespeak political answer. I challenge Gerry Kelly and Sinn Fein publicly to assert that they will live by their Committments to the Good Friday Agreement, as they repeatedly challenge others to and agree that my father’s murderer is returned to Prioson to prove that justice is seen to be done in the Unionist/Loyalist Community as well, because it certainly does not currently seem to be. The crux of dealing with legacy issues is that British government must be treated as a participant and belligerent, not allowed to act as if it could in any way take a role as an honest broker. There is such an overwhelming body of critical evidence of the British government’s role that the international community needs to take a lead in ensuring that gets addressed.